Extensive selection of food, treats, toys, cages, stands, accessories and supplements for your Eclectus Parrot. Everything you need for your Eclectus in one place. Find a healthy & nutritious food or treat, toys to keep your pet bird stimulated, spacious and safe cages, playstands, accessories & supplement. You and your Eclectus Parrot will be spoiled for choice. Browse our excellent range of products available for your Eclectus Parrot. Whether you’re looking for food, treats, or toys, we have everything you’ll need for your feathered friend. Entertaining your Eclectus doesn’t have to be a hassle. Choose from our selection of toys, ranging in all different sizes, styles, and designs. Keep ailments and stress away from your Eclectus Parrot with our stimulating toys made of parrot safe components to keep your pet safe from harmful additives. We offer different toy options for rattling, swinging, foraging, preening, and much more. When playing with your Eclectus, encourage new learning skills to keep them active and mentally stimulated and don't forget to reward for good behaviour. Our treats feature many flavours, organic ingredients, and added vitamins for a healthy and happy bird. 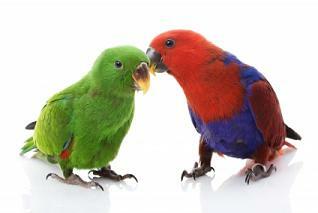 We at Parrot Essentials, firmly believe that we have the best food options for your bird. When it comes to quality, nutritious components, and organic ingredients, we have the competition beat. Browse our wide selection of complete foods, pellets, and fruit and vegetable mixes. To ensure your pet is getting the right amount of daily required vitamins and minerals to promote a strong immune system and keep illnesses away, we recommend trying our supplements. We have powdered vitamins to mix in with your bird’s food, treatments for worms, boosters for stressed or ill birds, and many other supplement options to suit your Eclectus’ needs. A large cage for your Eclectus is an absolute must. Choose from our wide range of open, solid and play top cages that will suit your parrot' needs for room to live in and play. Don’t leave your Eclectus’ cage bare. Add in some extra accessories to keep your bird entertained for when they are spending time inside their cage. Add an extra feeding bowl or perch, but ensure you’re not overcrowding the cage! Parrot stands are always a great idea to give your Eclectus more freedom. Using stands around your home means your Parrot can be with you no matter where you are or what you are doing. Browse from Java Tree stands, table top stands, or stands with roller wheels, making it easy to move throughout your home.